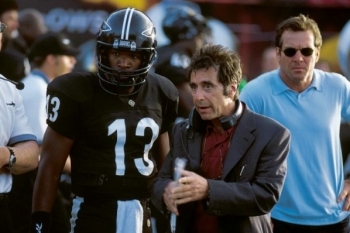 Any Given Sunday is a Film programme that first aired in 1999 and has been classified a 15 certificate. In the high-pressure world of American pro football, an aging coach struggles with crises in his personal life while battling to make his team successful on the pitch. He's not helped when his star quarterback is knocked out of the game and the gauche youngster who replaces becomes a danger to himself and to his players. But the coach's biggest headache is the daughter of the team's owner, obsessed with money and power. If you understand terminology like third string quarterback then this is the film for you. However, if you enjoy a fantastic ensemble cast, exciting and realistic sports scenes but don't have a clue about the game that Americans call 'football' then this could also be a film for you. Based on the bestseller You're Okay, It's Just a Bruise: A Doctor's Sideline Secrets About Pro Football's Most Outrageous Team, the movie was a labour of love for Oliver Stone who has a passion for American football. He realistically recreates the kind of mad sports passion and competitiveness that makes ordinary people turn a little bit strange and tribal. His warts and all account of this baffling game with its very particular jargon and what goes on behind-the-scenes manages to avoid too much stereotyping and cliché and instead, delivers one of the most authentic sports films ever made.